Barbets are a group of medium sized, chunky, generally colorful, frugivorous, hole-nesting near-passerines, that are popular targets for anyone birding in the tropics. They occur in three biogeographic regions; the Neotropic, Afrotropic and Indo-Malaya ecozones, basically tropical South and Central America, Africa south of the Sahara and tropical Asia. Originally they were all placed in the family Capitonidae, but over time taxonomists have determined that actual relationships between these barbets are far more complex. In the Neotropics the barbets have been placed into two families, the original Capitonidae (New World Barbets) with 14 species and Semnornithidae (Toucan Barbets) with 2 species (Toucan and Prong-billed Barbet). These American barbets are now considered more closely related to Toucans than they are to the barbets of other continents. 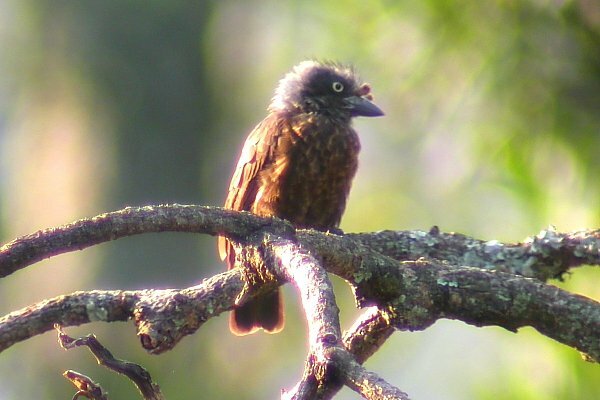 In Asia, their 30 barbet species are placed into their own family Megalaimidae, and finally in Africa, we have 42 species in the family Lybiidae, the topic of this blogpost. The diminutive Tinkerbirds are Africa’s smallest barbets, depicted here is Red-fronted Tinkerbird photographed at Lalibela, Ethiopia. In Africa, barbets occur throughout the continent from the tip of the Cape Peninsula to the fringes of the Sahara desert. 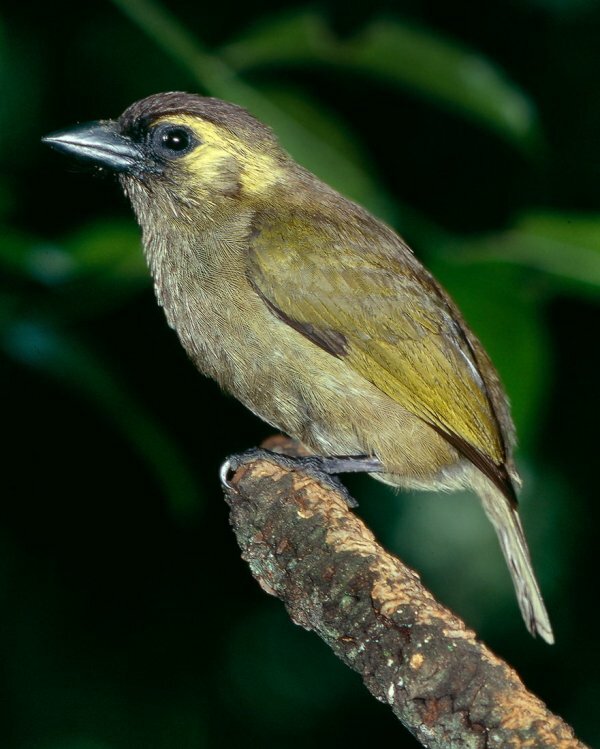 They range in size from the tiny 3.5 inch Tinkerbirds to the hulking 10+ inch Yellow-billed Barbet. Some are incredibly colorful, the vibrant Red-and-yellow Barbet comes to mind, while others are rather plain, and in fact can even be described as ugly, such as the Naked-faced Barbet. Some are obvious and largely terrestrial such as D’Arnaud’s Barbet and others are cryptic and a challenge to spot as they call from hidden perches in the canopy of the tallest rainforest giants. The Banded Barbet is a medium-sized barbet that is endemic to Ethiopia and Eritrea. This image was also taken at Lalibela, Ethiopia. Pogoniulus are the smallest, and the 10 species in this genus are now called Tinkerbirds due to their incessant tooting calls sounding like a miniature tinsmith or tinker hammering away. They are generally cryptic species and despite frequent extended bouts of calling, their ventriloquial skills make them tricky to locate. Most species live in the rainforest zone – notably the largest; Red-rumped and the plainest; Speckled which sounds like a Common Quail emanating from the rainforest canopy! Others, such as Yellow-fronted and Red-fronted extend into the savanna zone and are best located by staking out a fruiting tree. White-chested Tinkerbird is one of Africa’s avian mysteries, known only from a single specimen collected in 1964 at Mayau in north-west Zambia, close to the borders of Angola and the DRC. This remote region of Cryptosepalum forests is little changed by human hands (somewhat of a rarity in these times of devastating habitat destruction) yet this species has not been relocated despite extensive searches by birders (including myself). This has led some ornithologists to consider the specimen a hybrid of two other tinkerbirds, time will undoubtedly tell! Interestingly this species was named Pogoniulus makawai after its discoverer, a local man named Jali Makawa, who was employed by ornithologist C.W. Benson to collect birds. It is seldom that indigenous people are honored in this way. Yellow-fronted Tinkerbird is a woodland species that occurs widely through Africa. This image was taken in Murchison Falls National Park, Uganda. 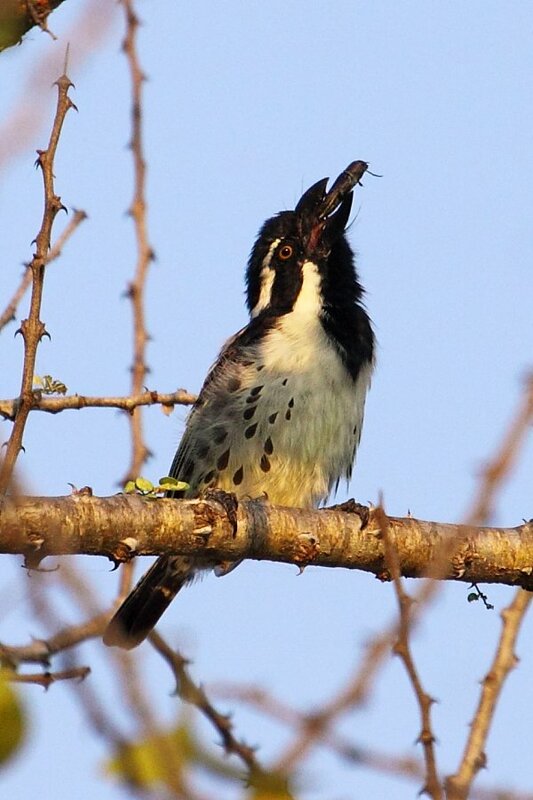 The Speckled Tinkerbird is a rather aberrant rainforest species with atypical plumage, a massive bill and an unusual call that reminds one of a Common Quail. Image taken by Markus Lilje in Cameroon. The four Gymnobucco species are Africa’s least observed group of barbets as they are restricted to the less visited tropics of central and west Africa. Naked-faced and Bristle-nosed Barbets occur in the forests along the west coast of Africa, Gray-throated in central Africa’s rainforests and Sladen’s is endemic to great rainforests of the Democratic Republic of Congo. They are all olive-gray in coloration, have variable extents of bare skin around the face, and all have loud hooting and trumpeting calls. Their generic name Gymnobucco translates to “naked-trumpeter” as a result of these features. They nest in colonies that sometimes number hundreds of birds, who excavate dozens of holes into the trunks of dead rainforest trees. Gray-throated Barbet is one of the plainer members of the African Barbet family. Note the strange nasal tufts at the base of the bill. This image is from Bwindi Impenetrable Gorilla National Park, Uganda. 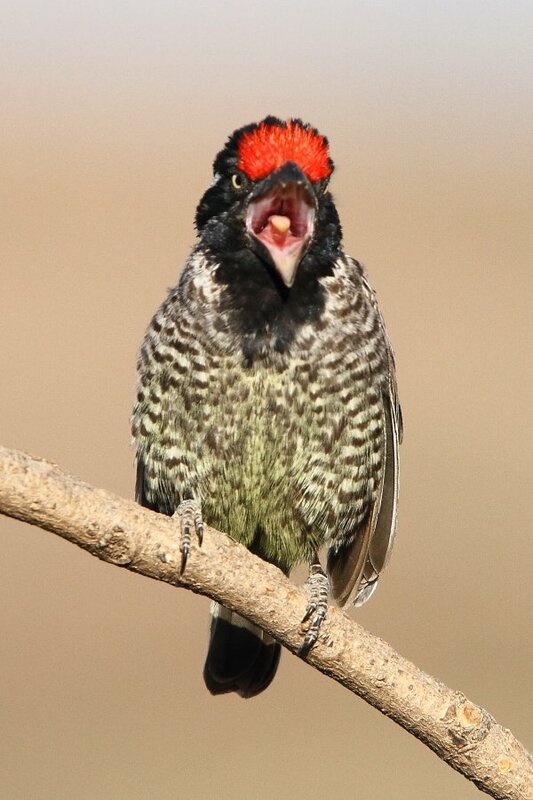 Bristle-nosed Barbet is a West African sister species of Gray-throated. These barbets nest colonially in dozens of holes bored into dead rainforest trees. This image was taken in Nsuta Forest, Ghana. The four Stactolaema barbets are generally a little more colorful than the Gymnobuccos. Anchieta’s and Whyte’s are restricted to the Miombo or Brachystegia woodlands of south-central Africa, White-eared to the forests along Africa’s eastern coastline and Green to scattered forests from south to east Africa. 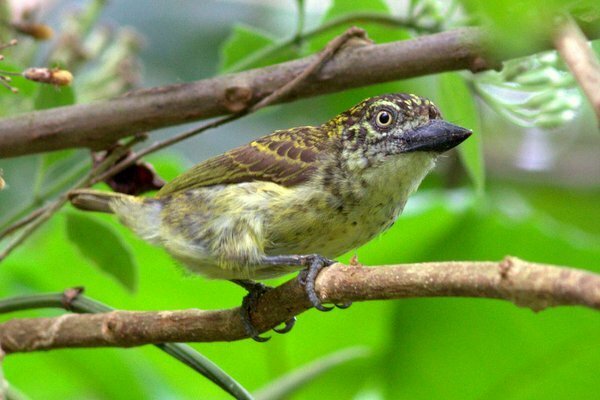 In South Africa Green Barbet occurs only in Ngoye Forest, a tiny forest patch in Zululand, and this form is often split off as Woodward’s Barbet. The next isolated populations are several thousand miles northwards in Malawi, northern Mozambique and the Rondo Plateau in southern Tanzania. Finally the most northern population ranges are found in coastal forests of northern Tanzania and Kenya. The reasons for this hugely fragmented population have yet to be fully unraveled. 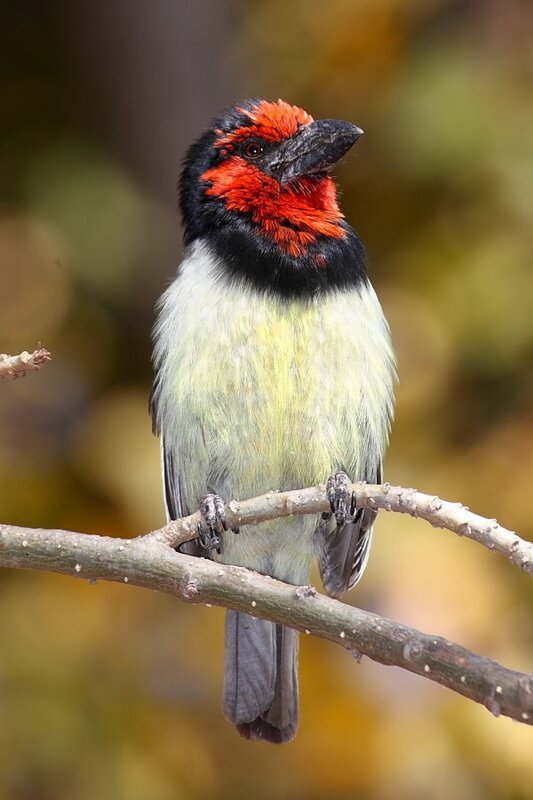 White-eared Barbet is a common, noisy species of coastal forests along Africa’s eastern seaboard. This image was taken at Makakatana in Isimangaliso Wetland Park, South Africa. Green Barbets have a disjointed population stretching from South into East Africa. This image is of the southern form which is restricted to Ngoye Forest in Zululand and is often split off as Woodward’s Barbet. Image by Hugh Chittenden. 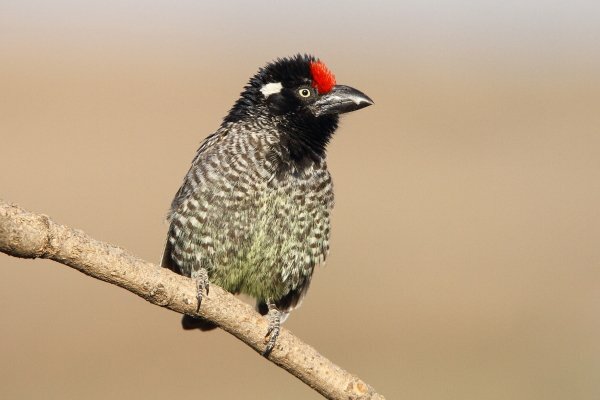 The 11 Lybius barbets are probably Africa’s most familiar and frequently encountered group. 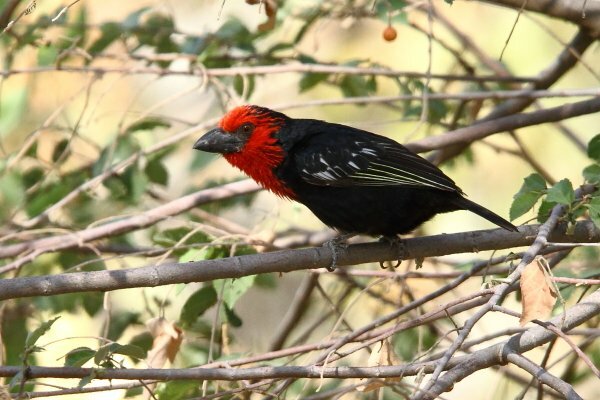 They include the well-known Black-collared Barbet, the red headed beauty that is common in gardens and woodlands of southern and eastern Africa. Its name is a frequent point of conjecture with birders, who wonder at the reference to a not very noticeable black collar, rather than its obvious glowing, fire-engine red head? Well, the answer is that the moniker Red-headed Barbet was first given to the South American species that still bears and thus it had precedence to retain the name. Another interesting fact is that their well known “tooo puudly” call is an antiphonal duet. In other words, the call emanates from a pair, one of which calls the first note and the other the second note, but in such perfect synchrony that an observer would never imagine the sound comes from two birds! 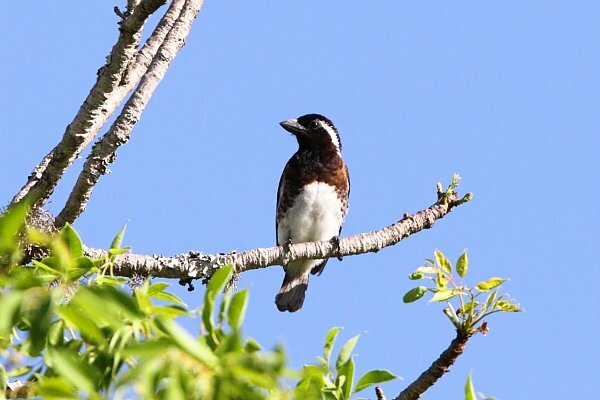 From northern Tanzania, Black-collared is replaced by Brown-breasted, and further north again by Black-billed. The little known Red-faced is found in moist broad-leafed woodlands of very southern Uganda, Rwanda, Burundi and remote north-west Tanzania. Vieilott’s is an aberrant species occurring in the dry Guinea and Sahelian woodlands south of the Sahara. Banded is an attractive species endemic to Ethiopia and Eritrea. White-headed can be found in huge fig trees in woodlands of east and central Africa with a tiny isolated population in Angola. 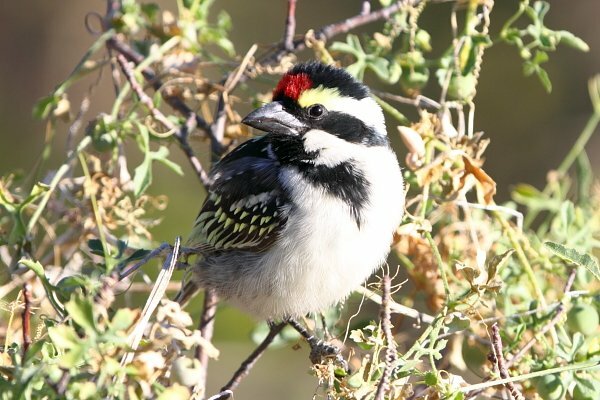 Another isolated population of White-headed is separated as a Chaplin’s Barbet, Zambia’s only endemic bird. The final four attractive black backed species are Double-toothed occurring in fig dominated woodlands along the equatorial zone, the similar Bearded in the Guinea savanna woodland zone, Black-backed of the more southerly Miombo woodlands and finally the highly sought-after Black-breasted Barbet. This last mentioned giant version has been seen by very few birders as its range coincides with the unstable, war-torn and bandit-ravaged zone stretching from northern Uganda to Southern Sudan, south-eastern Chad and northern Central African Republic! Black-collared Barbet is a common, woodland and yard bird whose familiar call is actually an antiphonal duet of two birds calling in synchronized response to each other. This image was taken in Pilanesberg National Park, South Africa. Black-billed Barbet is a northern sister species of Black-collared Barbet. This image was taken at Lake Langano, Ethiopia. White-headed Barbets frequent fruiting fig trees in woodlands of East and Central Africa. This image was taken in Nairobi National Park, Kenya. The seven Tricholaema barbets are a medium sized group, mostly with dark backs, paler underparts and variable spots. Miombo Pied, Acacia Pied and Red-fronted are sister species with red foreheads and non-overlapping ranges. 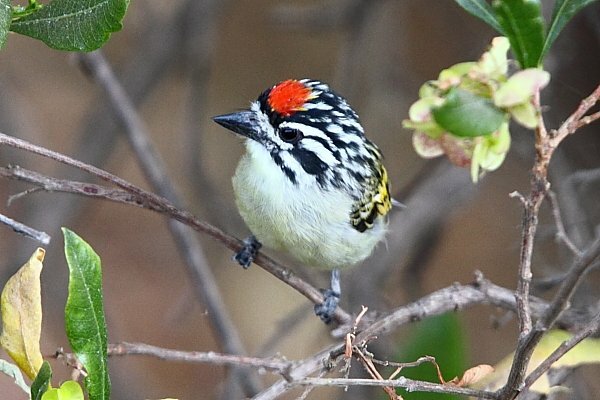 Black-throated and Spot-flanked are two similar species that share the arid woodlands of north-east Africa and the delightfully named Hairy-breasted occurs in the rainforest zone. The latter is sometimes split into two species, Hairy-breasted in the Upper Guinea forest zone of West Africa and Streaky-throated in the Lower Guinea forests of Central Africa. In both plumage and vocalization, they do differ and in my opinion are good splits. 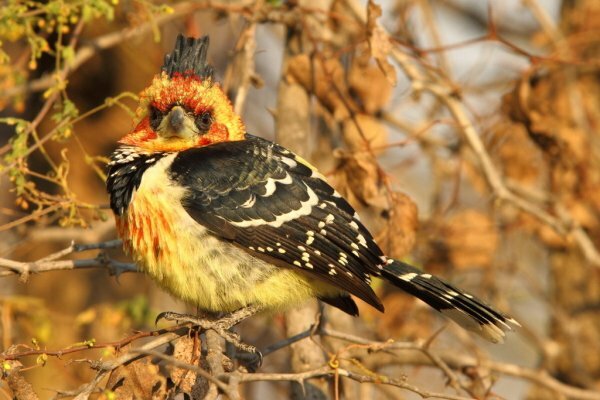 Acacia Pied Barbet is a Southern African near-endemic and is replaced to the north by Miombo Pied Barbet, which is itself replaced further north by Red-fronted Barbet. This image was taken in Namibia’s Erongo Mountains. Notice the attractive spotted flanks of this Spot-flanked Barbet. This individual is eating a beetle, unusual for mostly frugivorous barbets. Image taken in Selous Game Reserve, Tanzania. Very similar to the Tricholaema barbets is the beautiful Yellow-spotted Barbet, a monotypic species in the Buccanodon genus. Its appearance would seem to warrant its placement with the previous group, but its call is completely different, a soft purring sound. It is the only African barbet that taxonomically has no relatives placed in the same genus. The Yellow-spotted Barbet Buccanodon duchaillui is a rainforest species, named for Frenchman Paul Du Chaillu who was the first explorer to venture inland from Gabon into Africa’s vast lowland forest bloc. He discovered numerous new species for science including this barbet and was the first person to confirm the existence of both Gorillas and Pygmies. 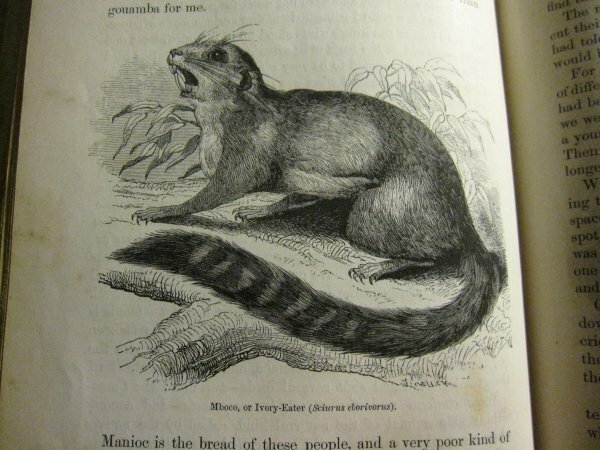 In 1861 he published this journey as ‘Explorations in Equatorial Africa’, a fabulous recount of his adventures and discoveries, and with typical Gallic flourish some rather imaginative encounters and fantastic species such as the Ivory-eater, a squirrel that hunts the forest in search of elephant carcasses to gnaw on ivory! Yellow-spotted Barbet is a beautiful, rainforest barbet and is the only member of its genus. Image from Kakamega Forest, Kenya. The Yellow-spotted Barbet was discovered and named for Frenchman Paul Du Chaillu during an expedition into the forests of Gabon. Other more fanciful discoveries on his journey included the Ivory-Eater (Sciurus eborivorus), a squirrel with huge gnawing teeth that scours the rainforest in search of elephant carcasses! The final genus of African barbets are the Trachyphonus tribe. These mostly yellow and red birds have repetitive, hard churring calls, hence their name that translates as ‘rough-voice”. 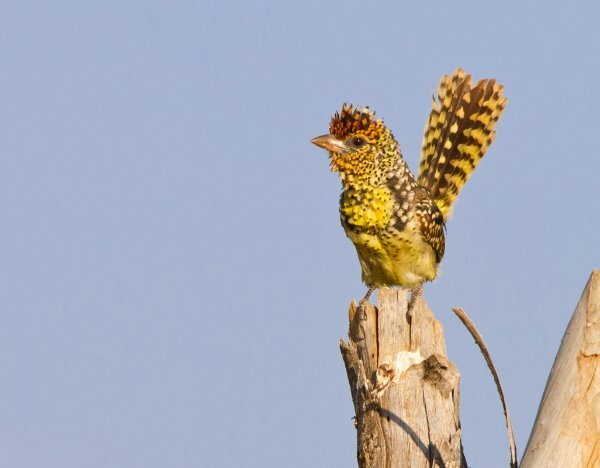 The southern African version is Crested Barbet and supports a floppy black crest. Due to its rather random collection of white spots, red blotches, yellow and black, it as also known colloquially as “Fruit-salad”. 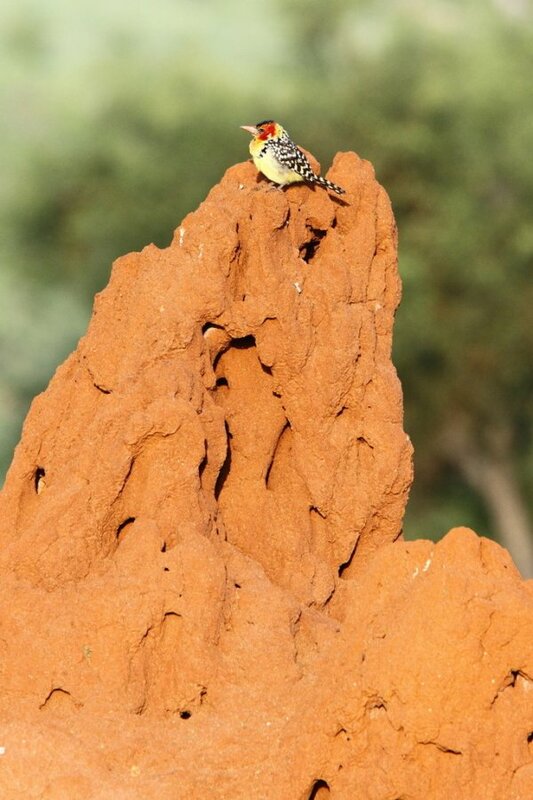 From East Africa, Crested is replaced by Red-and-yellow, an unusual species that nests in termite mounds. Yellow-breasted occurs in the dry woodlands to the north of Red-and-yellow, stretching westwards along the fringes of the arid Sahel. The curious D’Arnaud’s Barbet is a social species of dry north-east Africa that has a quaint tail-wagging clockwork-like display. Finally Yellow-billed, the largest of all our barbets. It is an aberrant species that in my opinion should be in its own monotypic genus. It differs from the rest of its sister species by its great size, bare yellow facial skin, the fact that it lives in the rainforest zone where is keeps concealed in dense tangles or high canopy from whence it utters a deep booming hoot that is repeated almost endlessly, much to the frustration of birders who generally spend hours fruitlessly searching for this ventriloquist! When lucking into a good view, its dark plumage turns into purples, mauves and even pinks, a beautiful bird belying the fieldguides that usually depict it far too dull, unlike the attractive living version. Crested Barbet is an aptly named species of Southern and Central African woodlands. Its nickname of “Fruit-salad” bears witness to its rather random pattern of red, yellow, black and white. Image taken in Kruger National Park, South Africa. 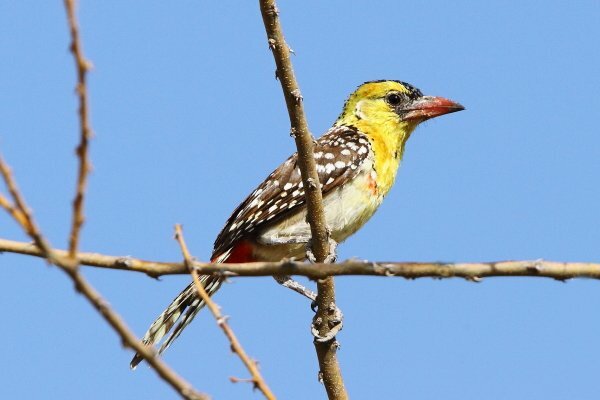 The beautiful Red-and-yellow Barbet replaces Crested Barbet in East Africa. Image from Lake Manyara National Park, Tanzania. Yellow-breasted Barbet replaces the previous species in the arid woodlands of North-east Africa and the Sahel. Image taken in the Afar Region of Ethiopia. D’Arnaud’s Barbet is a small, social species that spends much of its time on the ground and has a strange tail-wagging clockwork-like display that was being performed when I took this image in Ethiopia’s South Omo Valley. Africa’s largest barbet is an unusual rainforest skulker. Yellow-billed Barbet generally keeps to dense tangles or high canopy from where it utters a loud honking call. Image from Budongo Forest, Uganda. Barbets form a fascinating and colorful aspect of African birding and are favorites of birders, both local and visiting and I hope this blog will engender an even greater appreciation for these charming birds. Red-and-yellow Barbet is unusual in that it uses active termite mounds for nesting, most other barbets excavate holes in trees. Image from Tarangire National Park, Tanzania. Barbets often regurgitate seeds or pips since the bulk of their diet consists of fruit, especially figs. This Banded Barbet is in the process of regurgitating a seed. Image from Lalibela, Ethiopia. All images by Adam Riley except the Green Barbet by Hugh Chittenden and Speckled Tinkerbird by Markus Lilje. I cannot tell you how happy you’ve made me with this post about my favorite bird family in my favorite continent…There are few bird families with more character than the African Barbets! Great photos of some extraordinary birds! 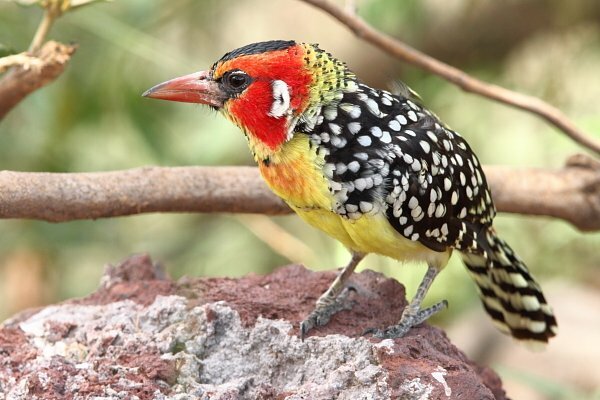 I love that spotted Red-and-yellow Barbet! Thanks for the great comments Eildert, Wendy and Clare & Grant. I’m glad to hear there are other barbet fans out there! Wonderful treatise on a fantastic family of birds. How I would love to see ALL of those! Where Are You Birding This First Weekend of June 2014?